If you are ready to deepen your understanding of color relationships, this class is for you! Based on the color theory of Johannes Itten, this class will awaken your ability with color. Painting exercises with casein paint lead you to understand color contrasts and color harmonies. You will learn the difference between intensity and value. This class requires an interview and the intention of completing the 16 week program. Color Theory Students learn to mix and manage color. The Art Process-Choices of the Artist -Learn to support your ideas with good composition and management of the elements and principles of design. The first Saturday, Linda Armantrout will give a Lesson and an engaging assignment for students to begin in class. Second Saturday, Students will finish their pieces, and offer them for critique. You are welcome to bring any piece for critique. Materials: When you sign up, Linda will send your supply list. Casein paints and the book the Art of Color-Johannes Itten. Cost: $130.00 due first Class of the month, each class is $70.00 if bought singularly. Once seats are filled, a waiting list is begun. Preference given to previous students and to those who intend to be ongoing through May. Call 303-664-0086 now to reserve a seat. This class will change your life and your art. The class is being offered online, so you can learn when you have time and wherever you are. This Basic Design class offers a strong skill set, in additon to nuturing your self-discovery. This is a 20 week program sold in 4 week blocks. You and I commit to one lesson per week, so you finish the class within 6 months and have the highest benefit from it. Lessons are emailed as pdf files. In studio, the student always has the option of working privately, or showing me the work for feedback. This will also be your choice as you choose what to send by e-mail for critique. I will also support you on the telephone and in my weekly Blog. When: 2.5 hours each week at your convenience. Start Now! Call 303-664-0086 for a FREE consultation and interview by phone or in Studio. Cost: $150.00 for block of 4 classes. 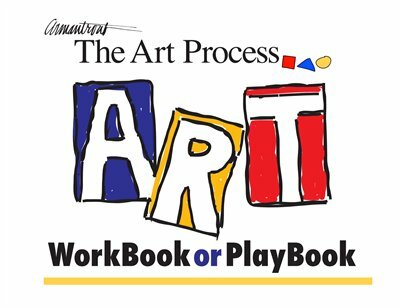 If you don't have time to take a class but want the art experience, buy the The Art Process WorkBook. "I have packaged this material in many ways for over 25 years. I learn something new every time I teach it. "—Linda Please see a preview by clicking below on the MagCloud badge. It is available as a real book on paper and is wire bound to lay flat while you do the lessons, or if you like, buy a digital version, or both. Click on the Cover below to preview and/or purchase the book.